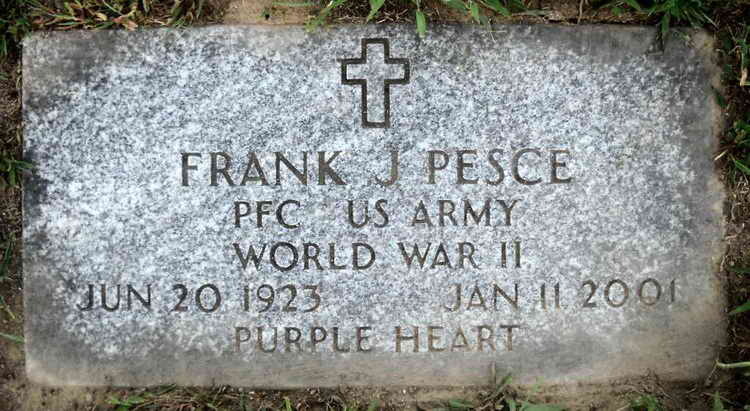 Grave marker of Frank J. Pesce in Saint Patrick's Cemetery, Somerset (Bristol County), Massachusetts. Although this stone indicates that Frank earned a single Purple Heart, he appears twice in the General Orders of the 508th PIR for an award of that medal. Those documents state that he was wounded in action on 7 July 1944 in France and again on 19 September 1844 in Holland. He was a member of the Headquarters Company, 1st Battalion.